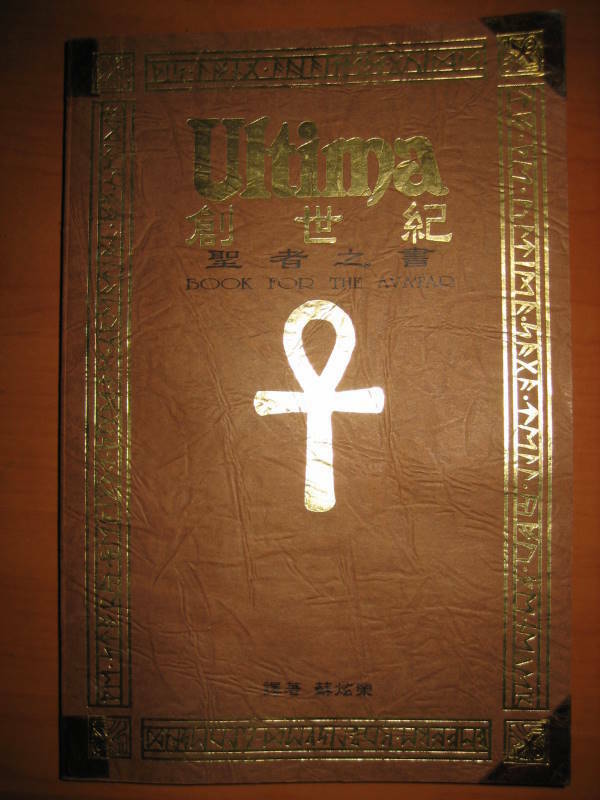 I was contacted out of the blue this week by the Taiwanese publisher of Book Of The Avatar which was a Chinese translation of the Official Book Of Ultima originally published back in June 1992. The print run of these was apparently just 500 copies making it one of the rarer Ultima collectibles and certainly not one I’ve ever had the chance to get hold of myself. It’s a straight translation of the original edition but the aim with this version was to make it look as much like an antique book as possible including specially selected paper and the leather/gold leaf effect cover design. It reminds me very much of the manuals that were packed in with some of the games and is far more appropriate as an Official Book of Ultima than the western release in that sense. It does have the obvious disadvantage that I can’t actually read it but that wouldn’t stop me wanting a physical copy in the highly unlikely event that I ever do run across one. In the meanwhile, I’ve been provided with a scanned pdf of the book which is now available here and also on the downloads page. Many thanks to Luke for sending this to the site. I’ve been sent a link to a scan of the second edition of the Official Book of Ultima. For the most part this is the same as the first edition, but it has solutions to the games that were released between the two being published. I’ve added this to the downloads here for anyone interested. Thanks to xyzzy for the link and to whoever did the scans in the first place. I’ve been struggling to find any spare time recently so I’ve not even looked at Terra Nova yet. I have added scans of the 11th Hour Guide though. This was published in 1990 by Compute! Books. It has been scanned in by Mirir and is available as a pdf in the downloads section of this site. I started reading this one before I went away but thanks to the scans could finish it off on my phone in the meanwhile. It originally came out around the same time as Ultima 6 and is something of an official history of the series up to that point, although it also serves as a short biography of Richard Garriott since the two are fairly inseparable. There were two versions of the book with the second adding solutions to later Ultima games into the second section. It was written by Shay Addams of Questbusters fame who judging by the content was a huge Ultima fan. In fact, I’d go so far as to say that the book descends into sycophancy at times which can get a little tiresome. I’m a fan myself but there is a limit. When it steers away from the hero worship, there is plenty of interesting content in here. The book works through the series up to Ultima 6, game by game. A lot of the early stages will be highly familiar to anyone with an interest in Ultima as RG is still telling the same stories to this day and I’ve heard them more times than I can cope with. The book has the time to go into more depth though and soon moves away from the more familiar stories into the early days of Origin and the second Ultima trilogy. I’d read this book before so not much of it surprised me as you can imagine, although I had forgotten that it implies that Ultima 6’s gargoyles were originally blue and the game was even jokingly called “Attack Of The Blue Meanies” by the developers. I’d like to have heard a bit more about Origin as a company. There are vague details about their humble beginnings where they packaged games in Garriott’s parents garage and RG wrote Ultima 3 in his parents closet which he was using as an office. Their other products are only mentioned in passing though and the book lives up to its name concentrating purely on Ultima. The second section of the book, contains solutions for the first 6 Ultima games. These are written in a narrative style to some extent with a few maps and tables thrown in. The narrative isn’t especially entertaining in its own right but it does give full walkthroughs for each game + exploits, neither of which were included in the regular Ultima cluebooks. The Official Book Of Ultima is more or less compulsory reading for an Ultima fan. Personally, I could have lived without the game solutions and I’d like to have seen vastly more detail in the first section. Understandably, this is aimed to be enjoyable to the more casual fan and Shay Addams did a decent job with it. It’s a pity there isn’t anything similar for the remaining games in the series, although there is a fairly lengthy retrospective interview with RG in the Ultima 9 guide book which I will get around to scanning in sooner or later.